(this drawing is thanks to: http://uwacadweb.uwyo.edu/CLAAS/Old%20stuff/bigspiral.jpg). 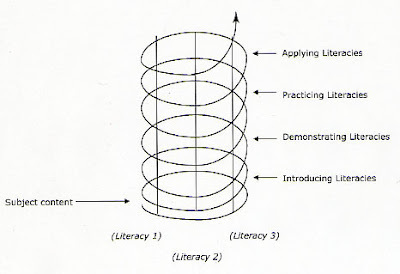 In this example, Literacy 1 might be 'Graphing', Literacy 2 might be the concept of Heat Transfer and Literacy 3 might be the skill of 'searching on the internet'. I've tried to plan a unit like this in the past using a spiral drawing but couldn't get it to work--I didn't really try that hard either. 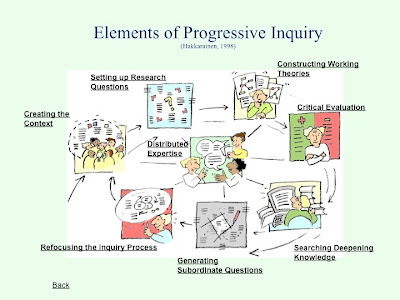 I think, however, that if there were some software that provided control over the spiraling time-line, mixing spirals, threads shown, snap-in placement, changing radius of spiral, adjusting colors of the vertical 'literacy's' well, one could have a powerful visualization tool for unit/curriculum planning. This would be a nice way to share our units and help practitioners (ie teachers) implement the curriculum. For those who aren't teachers, teachers have to be able to adjust from moment to moment what we are doing in the class to take advantage of the possibilities of the moment and meet the needs as they arise. All of this has to be done, of course, with the larger curricular goals in mind. Yes, so this tool could help one have those larger goals in mind.